1. In December, 2011 open houses, RICL representatives, including the Clean Line Energy Partners vice president Jaysheree Desai (formerly of Enron and Horizon Wind), claimed that they had not filed yet with the ICC. In actuality, they had filed in October, 2010 and in ICC documents state they wanted public utility status before the landowners were first notified in June, 2011. 2. RICL claims that they’ve had 600+ public meetings - really? Landowners weren’t invited to any “meetings.” We were haphazardly notified of June and December, 2011 “open houses.” A TOTAL of 26 “open houses” were held PERIOD for landowners across Illinois AND Iowa (two series of 13 “meetings” across both states). For those who did receive notice, it was unfairly short - 1 day to 9 days - if at all. We have asked HDR (the company studying the route for RICL) for the opportunity to check their records with what we have submitted to be sure that our comments and concerns were accounted for. We have received no response. Who else were all of the “600 meetings” with???? 3. Inability to pin anything specific down in writing: Simple questions commonly asked at the open house meetings took 4 weeks to get in writing and were carefully sanitized by the legal department. RICL reps prefer to talk on the phone. Why would that be? Landowners have offered that they could convey anything in writing. No reply. 4. When asked (in writing) for the obstacles to putting the line along route 80, we were told to be patient and wait until the route was filed with the ICC. Now that information is buried in eight inches of documents - if it’s there in any detail at all. 5. The majority of U.S. wind maps used in presentations by RICL do not clarify that they are only on-shore wind maps in showing how we “need” these transmission lines. They conspicuously omit the tremendous available wind power of the Great Lakes and Atlantic Resources. 6. 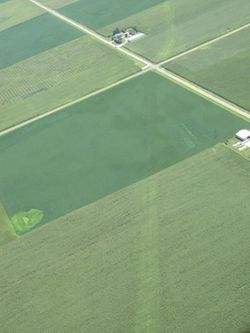 "Clean" Line claims that normal farming could take place under the lines, but apparently the "Clean" Line employee posting on their Facebook page missed the memo about the fine print that wasn't suppose to be "transparent." "Farming of row crops (e.g. wheat, corn, soybeans, etc.) can continue under the lines. There will be sufficient clearance under the transmission line to grow full-height crops (up to 10 feet tall), not including tree crops, and to operate standard farm equipment." Our response? SHOCK! Our corn was far above 10 feet this year. What's "Clean" Line's definition of "standard" equipments? 7. They quote jobs and subsequent development that “could” be generated. However, their figures come from a privately commissioned study (with whom execs and investors of Clean Line have close ties) and AWEA - hardly unbiased. They do not disclose that a huge percentage of that potential wind development is likely to be taxpayer dollars flowing to out of country conglomerates. Nor do they account for lost income, land devaluation, additional time and cost in production, loss of future development, lost crops from inablitily to cropdust, etc., in perpetuity. And why do they need 200-foot easements in perpetuity when the wind farms have an estimated 25-year lifespan and the transmission lines 40 years? See http://www.masterresource.org/2012/04/windpower-testimony-house-linowes/. 8. When they first started selling this project, they claimed the power was to go to the Chicago area. (In many of their presentations, they show all of Illinois as receiving power.) Now it is clear that minimal power would go to the Chicago area with the majority of the power going to the East Coast. 9. The sister project Grain Belt Express was to only go to St. Louis. It is now proposed to go through Illinois to Terre Haute, Indiana. 10. East Coast governors do not want mid-west wind. Ten East Coast governors have written congress twice saying that mid-west wind would undermine renewable energy and permanent jobs in their own state. They don’t need the wind power - they are on track or ahead of meeting their renewable energy goals. Off-shore wind is being developed in the Atlantic Ocean. 11. They lead one to believe that the lines would exclusively carry wind power. They won’t answer what happens when the wind doesn’t blow. True transparency would be admitting that new transmission also enables new development in fossil fuel generation including coal and gas. 12. Their construction video sent to some landowners and residents (not all as they have claimed) illustrates small, not-to-scale monopoles going along roads. In actuality, they want to put 28 x 28 foot (up to possibly 46 x 46 foot square) structures down the middle of prime farmland... because that’s the easiest and cheapest. And lattice structures are cheaper... probably coming prefabbed from China. 13. The capacity of the lines was first announced as 500kv. It is now +/- 600kv - that is not more/less, but positive/negative. Is that going to double down the road? 14. They introduced the project by obscuring the fact that it would carry three times the power of Hoover Dam. And it’s perfectly safe working, living, raising livestock and crops under this amount of EMF? The “Clean” Line execs are protected under layers and layers of LLCs. Who should we name in the class action lawsuit when that proves to not be true? 15. They neglect to say that, under the contracts already handed out, farmers are liable for damage to the poles and consequential damages. 16. They slide over the fact that they have to have access through fields to get to the easements in the middle of fields... more acres out of production and permanently damaged. 17. They claim no health concerns, but cannot produce relevant, current medical research. 18. They claim no interruption to GPS, but can’t produce evidence. In fact, completely uninformed reps at the open houses told our farmers that they could just program the towers and the equipment would drive itself around the obstruction. Really? And if the equipment hits the tower because of poor GPS (which they failed to mention), the farmer would be liable for the damage and subsequent damages all the way to the East Coast! 19. They cannot produce studies to back their claims of not interfering with normal farming. How about real studies about the real time and production costs associated with farming around 28 x 28 to 46 x 46 foot obstructions? 20. They cannot substantiate long-term costs to circle pivot irrigation, specialty crops, aerial spraying, etc. They claim you can aerial spray parallel to the poles. Really? What's the field orientation? What's on each side of the field? What's the wind direction? How silly is it to leave a wide swath across the middle of the field with whatever you were spraying to eliminate in the first place? 21. They claim there is no land devaluation. Are you kidding? Early estimates start between $200-400 MILLION and go up from there..... in ILLINOIS alone. What do you suppose the overall devaluation from the 250,000 acres of ROWS (right of ways) "Clean" Line hopes to obtain for their projects? 22. In open houses, they promise to fix soil compaction completely - on their website they say “as practicable.” Bottom line is that it cannot be fixed nor can they produce methods. 23. Reliability: Transmission experts say a line should only carry 30-35% wind energy for the system to stay stable. RICL would like you to think it would all be wind energy. 24. If any contracts have been signed and the landowners were not told that the Agricultural Mitigation Agreement has to be attached to the contract to be legally binding, the RICL was - once again - NOT TRANSPARENT. 25. They won’t answer what else they intend to do with the easements. Per the contracts already handed out - they can do, sell, add, etc., anything they want. 26.RICL claims that this will make our power prices go down, but prices need to go up 50% to be economically feasible. Unbiased studies will likely show that prices have to nearly double or triple for this project to be economically feasible. Hans Detweiler, Director of Development for “Clean”Line, was asked if he thought consumers were gullible enough to believe that this project would lower our electric prices. Mr. Detweiler’s response was that he didn’t really say that our prices would actually go down. In fact, in the article “Helping Hans” in Crain’s Chicago Business, Hans states that an almost 50% increase in prices is “modest” and would be needed to make the project economically feasible. And we're guessing that Hans wasn't 'transparent" and didn't bother to add that RICL's estimated delivery cost is $25MWh. Add your own ways the RICL hasn’t been “transparent” or forthcoming here by contacting us.